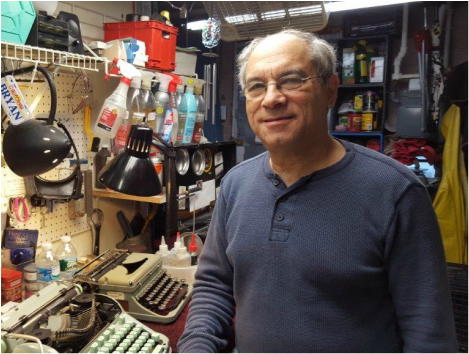 BRYAN KRAVITZ Raised in Northeast Philly, Bryan came into his own in 1975 when he took a six-week Typewriter Repair course at a trade school in San Francisco. An 18-month apprenticeship followed, and then a job, maintaining hundreds of typewriters at all 29 libraries at U.C. Berkeley. He also worked with the U.S. Navy, teaching typewriter repair. When computers changed the landscape, Bryan took a hiatus from full-time typewriter repair—until returning to Philly a few years ago. REPAIR Yes, we know your grandma’s model. We specialize in manual and electric, old and older is just fine. We can do very simple repairs while you wait, but most projects require one-to-two weeks. Our Warranty of one year covers all machines which we’ve cleaned, oiled and adjusted. Just don’t drop it, and your typewriter should last for years. EVENTS We host events throughout the region including typewriter bars, slow-writing workshops, and other engaging, hands-on experiences. WARRANTY Working machines sold by Philly Typewriter have been cleaned, oiled and adjusted and are warrantied for one year from the date of purchase. During this period, any machine not working correctly will be repaired, if possible, or, if necessary, replaced with the same model or a model of equal value. ​Customers are welcome to try their hand at almost any typewriter in stock, before purchase, or just for the pleasure of it.